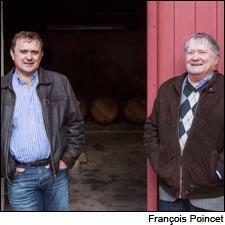 Winemaking consultant Jacques Boissenot (right) with his son Eric last year. Jacques Boissenot, one of the most important winemaking consultants of the past 50 years, passed away Sept. 3 in Bordeaux. He was 76. A student of Émile Peynaud, Boissenot worked with more than 200 châteaus, mostly in Bordeaux's Médoc region, including first-growths Latour, Lafite Rothschild, Mouton-Rothschild and Margaux. Even in the past decade, as he handed off most of his work to his son Eric, he continued to help their first-growth clients blend their wines for every vintage. Growing up in a home where wine came in jugs, Jacques never saw enology as a career. He was born in Beirut in 1938 to a French air force pilot and his wife. The family moved to Bordeaux when Jacques was seven. When it came time to attend university, he wanted to be a veterinarian, but failed to pass the entrance exam. A friend suggested enology. "I knew nothing about wine, but school was expensive and enology was just a two-year program," he told Wine Spectator in 2013. He flourished at the Bordeaux university's Institut d'Oenologie, where he studied under Émile Peynaud, whom many consider the father of modern winemaking in Bordeaux. After school, Boissenot went to work for an enology lab in Bergerac for several years. In 1974, his alma mater hired him to open a lab in Pauillac. Bordeaux wineries did not value the opinions of enologists at that time. "Château owners only came to us if they had a problem," Jacques said. "They called us ‘the chemists.'" But the 1974 harvest was wet, and the wineries had a lot of problems for him to solve. Soon he gained their trust. In 1978, Peynaud opened a consulting business and asked his old student to join him. They worked together until 1990. After Peynaud's retirement, the clients looked to Jacques. He earned a reputation for an incredible palate and knowing how to craft a balanced blend that reflected a château's terroir. He was also known for not seeking the spotlight. His son Eric began assisting him in 1990. In recent years, Jacques was still a regular presence at the Boissenot lab in the quiet town of Lamarque. He and Eric also worked and made wine from a small parcel of land near Margaux, Château Les Vimières. Jacques is survived by his wife, Anna-Marie, three children, and several grandchildren.